For the price of the Iraq War, we could've bought everyone in Sean Hannity's audience their own Swift Boat. 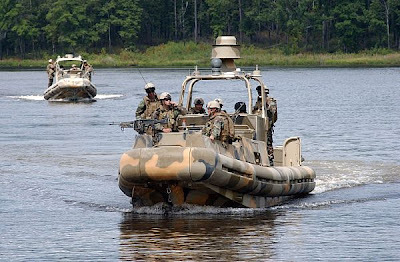 While the Vietnam-era Fast Patrol Craft are no longer being produced, Small Unit Riverine Craft are the contemporary equivalents of Swift Boats. Like the Swift Boats of the Vietnam War, they are equipped with armored hulls, radar, and three machine gun mounts, and carry small numbers of soldiers along rivers. The Marine Corps paid around $27 million for 40 of these boats, giving them a unit cost of $675,000. Right-wing TV host Sean Hannity has 3.5 million viewers. Buying each Hannity viewer his own Swift Boat would cost $2.36 trillion, which is $640 billion less than Joseph Stiglitz and Linda Bilmes' estimate of $3 trillion for the total cost of the Iraq War.